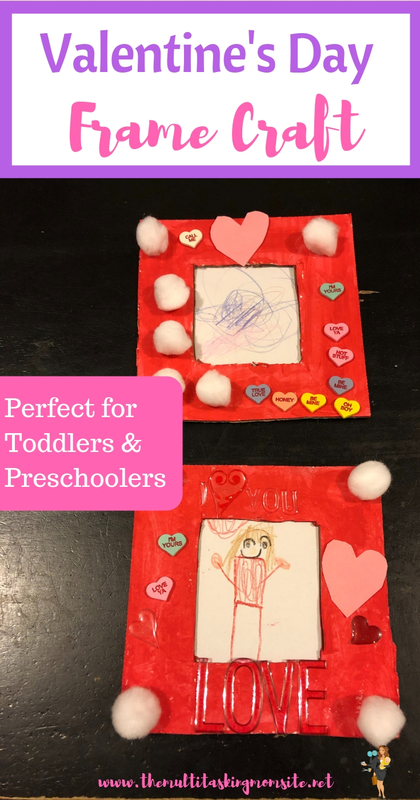 With Valentine’s Day coming up, the kids and I decided to create a new Valentine’s Day craft for 2019. We now have 2 kid crafters in the family so we needed to find something that both a 5 year old and a 2 year old could enjoy. We decided to create a Valentin’e Day Frame using all different media so that regardless of skill level, everyone could enjoy the project. Below I will list the items we used to make and decorate our frames. You can use some, all, or even add whatever items you have around the house. Things that we didn’t use but you might want to include are red and pink buttons, glitter, or markers. The first step is to create the frame. We used some cardboard from a package we got and cut out two squares. We then cut out two smaller squares from the center of these squares to form the frame. 2. We used the frame to measure and cut out paper for the inside of our frame. We cut the paper slightly smaller than the outside edge of our frame so that we could glue the paper to the back of the frame. We also traced the inside edge of the frame onto the paper so we would know how much space we had to draw/write inside the frame. 3. Then we painted our frames. 4. While the frame dried, we created the pictures that would be inside our frames. We used crayons, but you could also use markers or colored pencils, etc. 5. Once the frame was dried, we decorated it with pom poms, stickers, and the hearts we cut out. 6. Once the frames were fully decorated we glued our pictures into the frame. I think they came out pretty awesome! This was definitely a fun project to create with the kiddos and we were able to use stuff we already had at home. If you are looking for some other Valentine’s Day crafts, just check out the related posts below. I hope you have a blast creating this with your kiddos! If so, share your frames on my Facebook page so that I can check them out! Newer PostWho Are You Trying to Prove Yourself To?